How can we access My Magazine application in Galaxy S5? 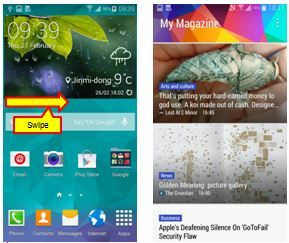 In Galaxy Note 3, you have to flick your finger up from the bottom of the screen or press the Home Button to access "My Magazine"
In Galaxy S5, you only have to scroll to the right of the Home Screen to open "My Magazine". It will display live social network updata and news that you are interested in.